Ahna and Kevin started their business in 1991. Ahna graduated from Randolph-Macon Women’s College with a four-year degree in Art History. After completing her degree, she studied English fine and decorative arts at Sotheby’s London and then went on to earn a degree at the Inchbald School of Interior Design. This led to a love of all things English, with a special emphasis on the fine and decorative arts. After finishing her studies, Ahna stayed in London and worked for several designers and antiques dealers. After graduating from the University of Connecticut’s School of Journalism, Kevin worked as a newspaper reporter and editor. He soon began to write about the antique trade, becoming the assistant editor of the Antiques and the Arts Weekly (The Newtown Bee). He quickly decided it would be much more interesting to deal rather than write about others doing it. Yew Tree House found a long lost window seat from Kenwood House, designed by Robert Adam and made by William France, circa 1768. With a partial donation by Yew Tree House, the bench was reunited with its original home and can be seen in the library, considered one of Robert Adam’s most important interiors. Set of 10 dining chairs by Thomas Chippendale, almost certainly supplied to Sir James Ibbetson, for Denton Hall, Yorkshire, circa 1778. A George II carved armchair with original back and seat from a suite attributed to Alexander Peter from Spye Park, Wiltshire (see one from the same suite in the Lady Lever collection at Port Sunlight). 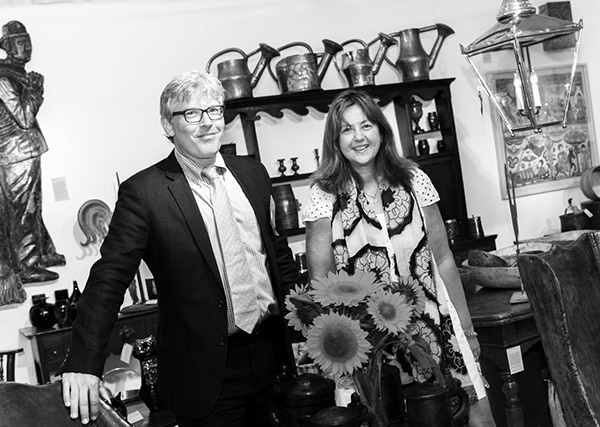 Yew Tree House has some of the top tastemakers in fashion, film, stage and television and business leaders among its clients, along with top directors, producers, actors and other media personalities, noted artists, writers, photographers and, of course, other antique dealers.